59 May the 29th in y yeard 1706 John Flewell was took tennant to hobkins two growns at [illegible] Shallborne Woods. This plaiste will heale a marmole and a canker and a fester and wounds and all other sores if [thon?] put thereto one ounce of waxe ollibanon (olibanum) and myrrhe of each a dram for a sore brest ye must be broken Take one handfull of ground [silt?] 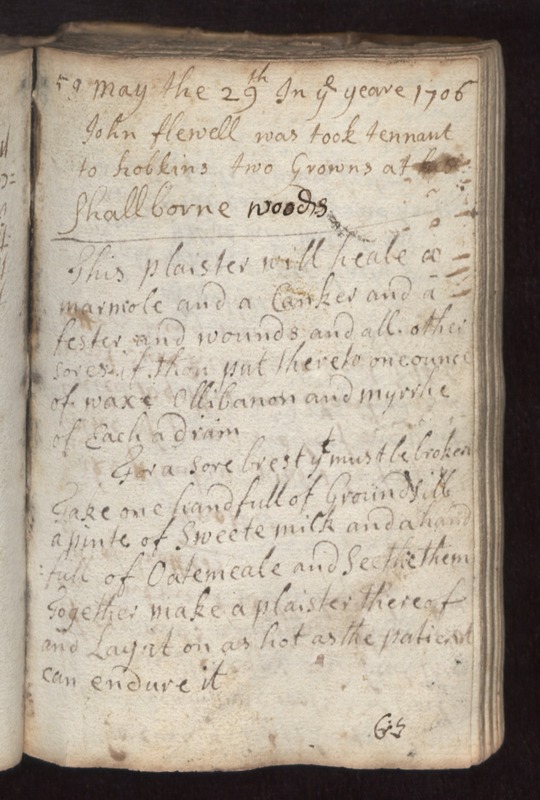 a pinte of sweete milk and a handfull of oatemeale and seethe them together make a plaister thereof and lay in on as hot as the patient can endure it.